It’s been a while since we’ve included anyone in this series – which began with Bruce Boyer and Alan See – for which I apologise. The next to be included is George Wang, owner of the BRIO store in Beijing, China. George is a good friend and a sharp dresser, and I’m always interested in what he pulls together. Here, as with the previous posts, we ask George to pick out a few favourite outfits and explain the thinking behind them. For more on BRIO, and our book launch there last year – see the earlier post here. 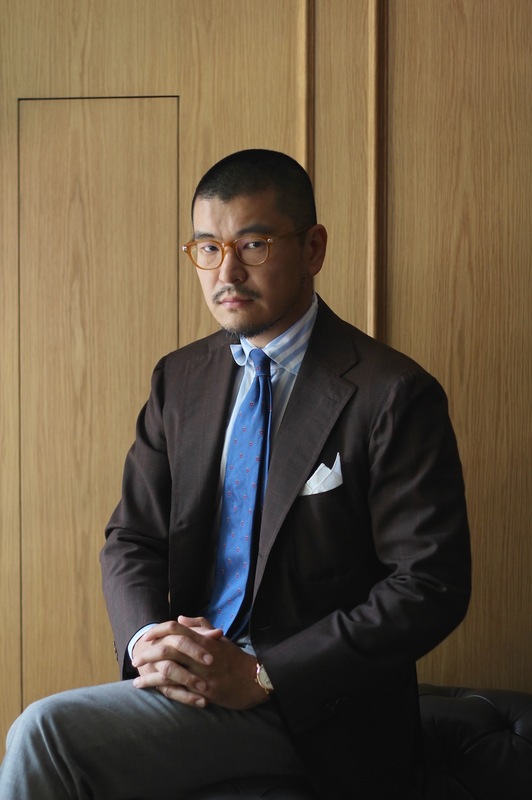 "After close to seven years of seeking out tailors and other menswear craftsmen in Europe and Asia, I feel like I'm past the exploration stage of my sartorial journey. I'm mostly enjoying the rewards from the time and money invested in discovering my style. Opening BRIO is a way for me to share my knowledge and taste, and help my customers develop their style, to understand quality and the culture behind the products. Like most people, when I begin to dress in a more classical way, I placed a lot of emphasis on "correctness" and maximizing the impact of my outfits. I would research what colors and fabrics are meant to go together, whether you can wear derbies with a double-breasted suit or not, and all sorts of other silliness. As my experiences accumulated, my taste matured - and now I would say my past sartorial failures and triumphs re the best reference I have in dressing every day. Rather than adhering to any rules established long ago in an almost irrelevant time and circumstance, I now have my own philosophy on putting together the best outfits for me. It’s actually not easy to pull off the sports jacket and jeans look, as anyone that has tried will know. Both the jacket and the jeans have to be of a certain style. A super structured English jacket will never work with a pair of vintage-style jeans, and a pair of skinny Italian-style "dress" jeans just look bad anyhow. In my opinion, to wear jeans with a tailored jacket, you need to go with a southern Italian tailor, who cuts a soft and casual jacket with volume in the right places. Fabric is also important of course, with the goal to echo the roughness of the denim in the sports jacket. In this photo I'm wearing a dark-blue wool hopsack jacket made by a Florentine tailor with a pair of well washed jeans from Orslow. Also a final word on the jeans themselves. I think they have to have a certain ‘tailored’ look to them. That is not to say they have to be bespoke but rather the right length, width, and rise can make or break the outfit. I like fabrics made from a mix of silk, linen, and wool for summer jacketing. 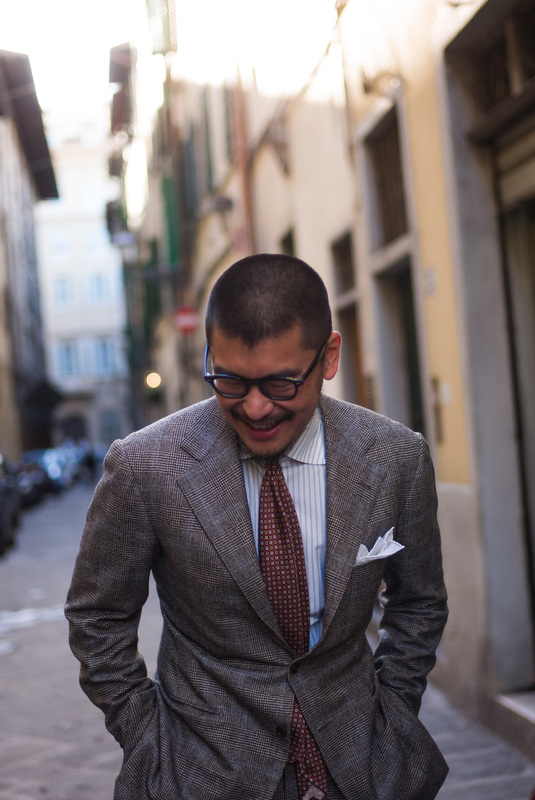 In this photo taken at Pitti Uomo last summer, I'm wearing a jacket made with a vintage Zegna fabric of this blend. The linen makes it cool wearing, the wool gives it a bit more crease resistance, and the silk lends it character. A pale grey jacket can be difficult to match. Obviously grey trousers won't work and while white trousers are very complimentary, they can make the outfit look a bit contrived. A pair of well-worn, faded jeans or medium-blue Irish linen trousers can work, but generally I prefer cream or beige trousers with grey sport jackets - one of those rare occasions when clashing colours can work in an outfit. My shoes are unlined loafers from Stefano Bemer and the shirt is made-to-measure by Avino in cotton/linen. There is a trend to combine outdoor clothing with tailoring nowadays, and a classic Barbour jacket is possibly the most popular choice among many men. They just never seem to look bad, whether you’re wearing a serious Savile Row suit underneath or casual Neapolitan tailoring. Personally, I don't like too much contrast and clash of ideals in an outfit. I don't think you need to be in the countryside to feel right about wearing a Barbour waxed jacket, but you shouldn't wear it to your office at Goldman Sachs either. To me this is a great piece of outerwear on your days off, or when the weather is challenging. I like to throw it on when I'm heading out at the weekend. 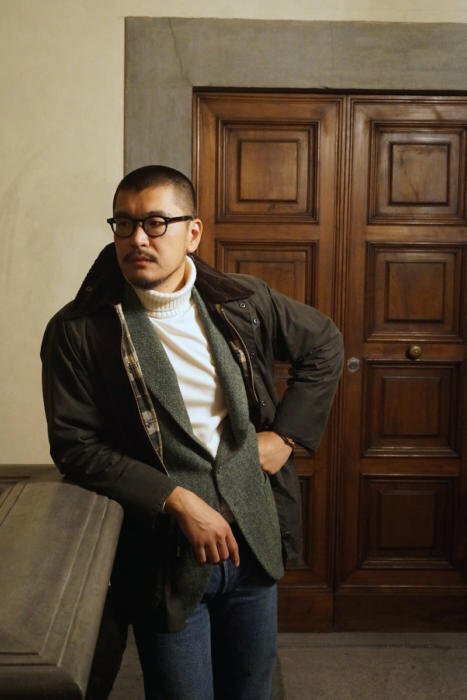 In this photo taken on one of those less busy days in Florence this past January, I'm wearing my Barbour with a Harris Tweed tailored jacket, a cream roll neck sweater and a pair of jeans. A linen suit is a bit of a contradiction today. A suit is seen as inherently formal, yet linen with all of its creases and wrinkles has no real place in a formal work environment. Still, I find that the very fact that linen suits are never taken seriously means they can become one of the most casual and elegant examples of tailoring a man can wear. The charm of linen is derived from both its texture and colour variety. In this photo taken at my store BRIO last June, I had on a brown-grey linen suit made by my Florentine tailor, worn with a BRIO navy polo shirt and a pair of white canvas sneakers from a Japanese brand called Doek. I like to wear my linen suits with casual tops and sneakers to further tone down the formality of it. China has a very casual dressing culture. Most men outside of the finance industry don't even keep a tie in their wardrobe. I joke about buying ties for BRIO not really being concerned about selling them, but rather how they will look in the store. On occasion though, I still like to put on a tie, even with a sports jacket and odd trousers as shown here. I normally don't like to wear pocket squares anymore, but in this case, because the jacket is quite dark and the shirt bright, a white linen pochette brings a nice finish to the whole thing. The jacket is made by my Neapolitan tailor using an old jacketing fabric from Loro Piana, and the trousers are made by my Florentine tailor. 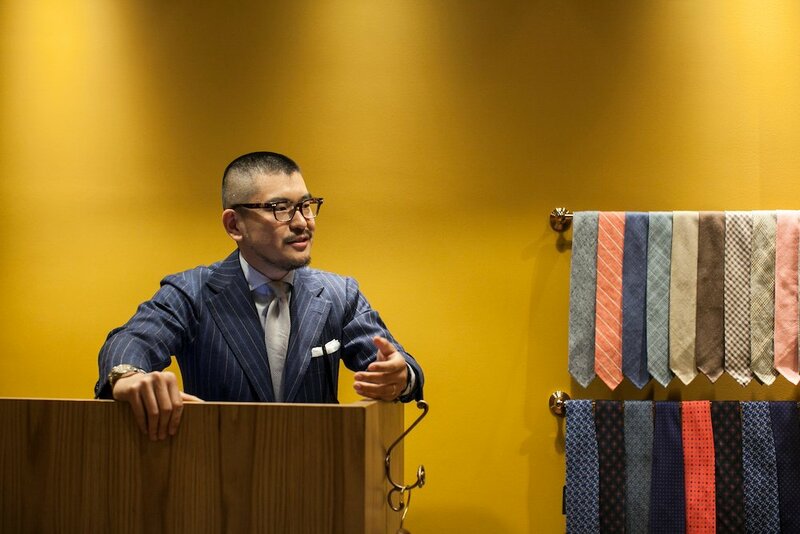 The shirt is made to measure by Avino and the tie is by Kenji Kaga. By the way, the touch of sprezzatura to my shirt collar is completely unintentional, honest!" You can follow the discussion on The sartorial journey: How to dress like George Wang by entering your email address in the box below. You will then receive an email every time a new comment is added. These will also contain a link to a page where you can stop the alerts, and remove all of your related data from the site. Very good stuff. Love Georges’ style. Great read Simon, I really enjoyed this series. I’m wondering what Georges’ intention ist to be referring to his tailors as “my Florentine / Neapolitan tailor”, instead of mentioning the tailors names themselves. I think this originates from a clothing website called styleforum.net. When users posted pictures of their outfits, some started to refer to their craftsmen as mystery bespoke tailors to keep others from going there aswell or to keep people with commercial intersts out. I think George posted there aswell and might have picked this habit up . Still, I think he holds trunk shows with Dalcuore from Napels and Liverano from Florence, so it’s probably safe to assume that talks about these two. Before I entered the industry, I was quite open about sharing information about my tailors. The stories I shared were all positive, and being a private person, those opinions were construed as fair and objective. However now that I am in the business, whatever I say or is deemed to be representing may be taken as advertorial, and sometimes that would invite various degrees of suspicion and speculation that are unwanted both on a personal and business level. For this reason I have slowly stopped disclosing the details about my personal wardrobe when it comes to tailors/shoemakers/artisans. Perhaps I’m the one being too sensitive. On the topic of jeans, do you think a mid grey flannel jacket could go well with a darker pair of jeans? On jeans What do you think his interpretation of Italian “dress” jeans are. Just skinny normal dark denim, or rather those trousers made from lightweight denim I have seen a few Italian stores. The former I believe, though George is also going to answer some of these questions himself here. What I mean are usually those “jeans” made by brands that traditionally makes dress trousers. These jeans tend to be skinny, low rise, made with stretch fabrics, and features wash effects that look contrived. I really believe in the authenticity of style and dislike when a maker known for a certain products try to make another product that is seemingly related, but was really conceived for an entirely different purpose. You know like if Barbour made a Beaufort in cashmere, or if John Lobb made a basketball shoe. I don’t quite get why flanell wouldn’t go with denim. Isn’t the texture a bit flecked in a way that would create a good contrast? Cf Donegal tweed and denim. Just the article I’d been waiting for! Excellent stuff! A great post if I may say so. 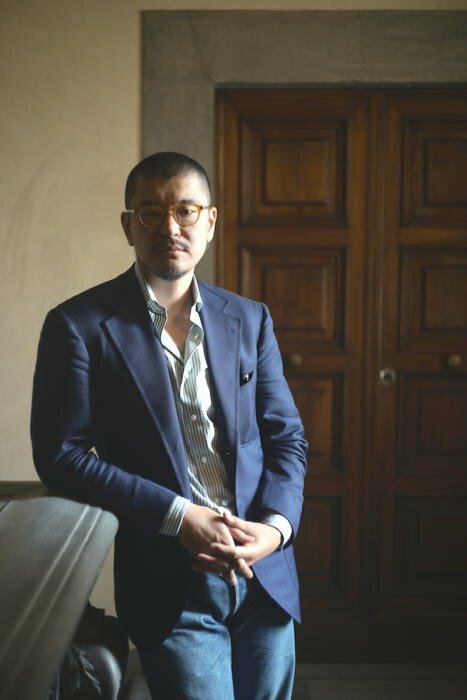 Reviewing the post on Alan See again its clear that he, Mark Cho, George etc are in the vanguard of a style movement coming from Asia that is based on high quality clothing much of it bespoke. More importantly they seem to be able to transcend the garishness of the Pitti Uomo peacocks by putting together outfits that are far from conservative yet by use of clever combinations and use of colour seem almost muted until examined in detail. I particularly liked Alan’s comments on skin tone with lighter coloured jackets. I was at the Goodwood Revival this year and came across a group of young Japanese men that were astonishingly well dressed. I guess that the nearest which we have to the Armoury in the UK is either Drake’s or Trunk. Both good shops but are you aware if there are plans for say the Armoury to open a shop in London ? Not currently, no. They looked at it a few years ago but couldn’t find the right space. To me the value of an article such as this is not to whom George goes for his tailoring but the style tips. As a relatively inexperienced person in putting a style together it’s the mixture of colour, texture etc that I learn from, plus I like the comment about going beyond the conventions – “derbies with a double-breasted suit or not, and all sorts of other silliness.” Not all of it suits me or perhaps is to my taste but often the germ of an idea gets through to adapt something I already have or thinking of getting. Very useful article, Simon – I look forward to more like this. It’s a great series Simon. There is only one picture in casual dress and I like to wear casual. But white shoes in one of picture I like most. By coincidence to the timing of this very good piece, on a free afternoon yesterday I visited the shop. George generously gave me some time to talk about past stuff and his future direction . He is a very very nice guy and the gun club check jacket he had on was probably the most perfectly proportioned and beautifully tailored I’ve seen. As a ps to my previous post the curation of the stuff in the shop is outstanding. Thank you for your visit, I really appreciate your comment! Those are some really great outfits, George. Would you say the key thing you learnt or perfected in the 7 years was toning things down and keeping it simple? I would say feeling comfortable and there fore confident is the most important aspect of dressing well. And by comfort, I mean to say being physically at ease, visually coherent, and being in harmony with the surroundings. Georgey is by far the best dressed colleague that I have ever encountered in my short career. Such a great honor to have worked with him.